When a painter has a spill, it’s an emergency, the consequences of a tipped-over gallon of paint are almost too gruesome to consider. That’s why painters need TIDDOX's RAG-ON-A-ROLL, or "ROAR". 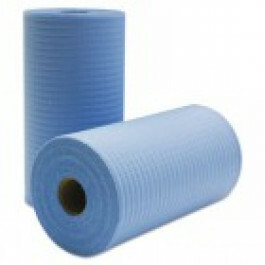 ROAR is a roll of paint absorbing cloths that can contain a mess and spill to a limited area, reducing the cleanup. These paint disposable wipes are made with four sheets of paper made from wood pulp, layered with nylon mesh. This creates a strong wiper for painters cleaning paint equipment or scrubbing off graffiti. So often, paint cleanup is difficult because paper towels are just too fragile for the job, but cloth wipes are too expensive. With Rag-On-A-Roll, you have paint disposable wipes that are tough enough to scrub up a mess, yet absorbent enough to hold on to solvents, chemicals, spirits, and yes – even paint. Viscous fluids such as paint absorb easily into ROAR, making them invaluable for use at construction or remodeling sites. This is one of the few paint scrim wipes that is strong enough to handle heavy duty cleaning jobs and still contain cleaning fluids. And, it’s disposable! You don’t have to use even more chemicals to get the chemicals out of your cleaning rags. Just dispose of your "ROAR" wiper as you do your empty paint cans and other paraphernalia. Use them for paint brush cleaning so that you don’t have to throw out your favourite angled trim brush. These paint wiping rolls each have 200 sheets, and they’re perforated to reduce waste. That’s a good thing, because they’re hard to tear without perforation! Give Painter RAG-ON-A-ROLL a try, and you’ll love them! Other related products from TIDDOX's painting range of cleaning wipes are the LOW LINT INDUSTRO WIPES, the SOLVENT RESISTANT WIPES, and the WHITE T-SHIRT RAGS.